As you and your child consider their future following graduation from high school, it is important to have a clear picture of all the options for a college education. There are more than 4,000 accredited colleges in the United States. Given so many options, we recommend narrowing down the choices that are best suited for your child. This can be done by examining type of degree to pursue, tuition and other costs, and admissions requirements. Upon finishing high school, most students decide between pursuing an associate’s degree (typically a two-year degree) or a bachelor’s degree (typically a four-year degree). The associate’s degree can be the first two years of the four year bachelor’s degree, or it can be used to learn a specific vocational skill, depending on the school and its offerings. After completing a bachelor’s degree, there is an option to pursue postgraduate degrees such as a master’s degree, professional degree, or doctorate. Some doctorate and professional degrees include M.D. (medical), J.D. (legal), PharmD (Pharmacist), or PhD in a specific subject area. Typically it takes one to three years to earn a master’s degree and three more years for a doctorate. The graphic below details the basic tuition cost of college. 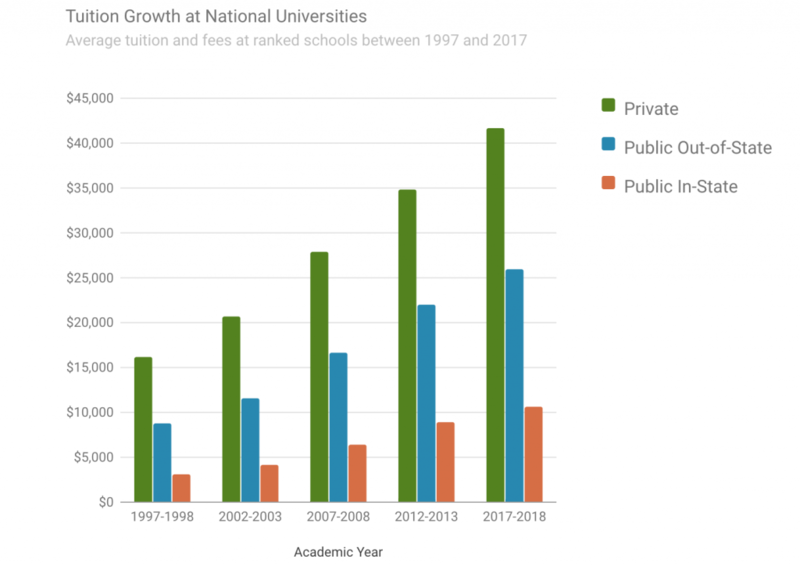 College tuition has been on the rise for decades and shows no sign of stopping. So, if your child is currently in middle school, the costs you see today will likely be much higher in four years. These numbers include tuition only. Factor in an additional $12,000 per year for room & board, and also add the costs for books, supplies, transportation, and personal expenses. The cost of traveling back and forth between home and school during school breaks should also be factored. When reviewing tuition cost, keep in mind the difference between in-state vs out-of-state tuition. Out-of-state tuition is usually 40-50% more than in-state, because each state subsidizes its residents’ tuition by using earmarked tax dollars to pay for college costs. The most important thing to consider when thinking about college admissions is to start preparing early. By “early,” we mean eighth grade. Below are the two major factors that all admissions officers consider within any student’s admission application. Extracurriculars – what else did the student do during high school? Leadership – what leadership roles, if any, did the student have? Essay(s) – Most schools require at least one essay, which enables the student to go into more detail on any of the above items, either to explain anything that might be negative or to highlight and expand upon a positive. These are the basics of U.S. College Admissions. The key to a successful college admission process is to start preparing early!